Robbie Neilson labelled John Beaton's decision to send off Blazej Augustyn "shocking" as Hearts lost a pulsating Scottish Cup Edinburgh derby 1-0. Augustyn was shown a second yellow card for apparently throwing the ball away after Hibs were awarded a free-kick. "We're trying to get the game going, so Augustyn throws it back to the exact area of the free-kick," said Neilson. "I don't think the referee sees it. I think he sees the ball coming back and decides he's going to send him off." Hearts had goals disallowed for offside in either half, having fallen behind to Jason Cummings' early strike. The Tynecastle side succumbed to a late Hibs rally in the first leg, surrendering a 2-0 lead in the final 10 minutes, resulting in Tuesday's replay. "We're devastated to be out," added the Hearts coach. "We should have scored, we had numerous chances, the ball in the net twice and other chances we didn't take. "The game was won at Tynecastle in the last 10 minutes. We should have seen it out and we didn't." The Hibees too were reduced to 10 men with goalscorer Cummings incurring a second booking shortly after Augustyn's dismissal. 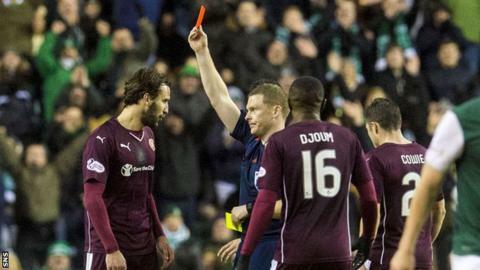 Cummings had been shown yellow for celebrating his opener in front of the Hearts support and was dismissed when Beaton judged him to have kicked the ball away from a Hearts free-kick. Hibs head coach Alan Stubbs was disappointed neither side finished with their full compliment. "I thought the two sending-offs spoiled it a little bit because they weren't really for too much," said Stubbs. "Jason's (was for) what we've said all along - we're not allowed to celebrate now. Jason didn't leave the pitch, I don't think he's been provocative, he's just stood there. "The second booking I think is for kicking the ball away, which is not what he did. If anything, he was getting the ball. We're disappointed with that. "I thought they spoiled the game a little bit. We want to play these games and these occasions with 11 players on the pitch for both teams." Stubbs, whose side face Inverness Caledonian Thistle in the quarter-finals, added that he had seen replays of Hearts' disallowed goals and that both were called correctly by the officials. "When you look at the whole game, I thought we had the clearer chances," he said. "Hearts put us under a lot of pressure with balls into the box where anything can happen. "They had a couple of goals disallowed for offside - I've seen them and they were offside - but they are a really good team, we stood up to everything they've thrown at us and I don't think anyone can deny us going through tonight."